Dover sole isn’t necessarily “from” Dover, but this English fishing port had plenty of it in the 19th century. I guess the name stuck. 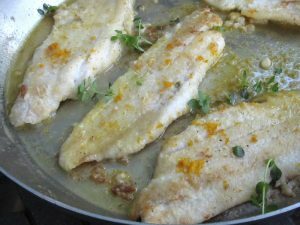 Sole is buttery, sweet and flaky and this recipe from the Barefoot Contessa is classic and fresh. The sole filets are quite thin, so have the other parts of your meal ready to go as the fish cooks lightning fast. Why does my lemon zest look orange you may be asking?? I used Meyer lemons AGAIN. I’m addicted to those juicy little fruits. Combine the flour, 2 teaspoons salt, and 1 teaspoon pepper in a large shallow plate. Pat the sole fillets dry with paper towels and sprinkle one side with salt. Heat 3 tablespoons of butter in a large (12-inch) saute pan over medium heat until it starts to brown. Dredge 2 sole fillets in the seasoned flour on both sides and place them in the hot butter. Lower the heat to medium-low and cook for 2 minutes. Turn carefully with a metal spatula and cook for 2 minutes on the other side. While the second side cooks, add 1/2 teaspoon of lemon zest and 3 tablespoons of lemon juice to the pan. Carefully put the fish filets on the ovenproof plates and pour the sauce over them. Keep the cooked fillets warm in the oven while you repeat the process with the remaining 2 fillets. When they’re done, add the cooked fillets to the plates in the oven. Sprinkle with the parsley or thyme, salt, and pepper and serve immediately.